According to Dave Bunnell, president of the Mission Valley chapter of Pheasants Forever, public lands are the stage for most hunting and fishing in the Mission Valley. “Ninety percent of hunters in the area spend 100 percent of their time hunting on public lands,” he said. Lake County land accessible to hunters and anglers from the public is managed by a variety of agencies. Hunting and fishing permits can be obtained for land owned by the Confederated Salish and Kootenai Tribes, the state of Montana, and the U.S. Fish and Wildlife Service. With proper permits and attention to regulations specific to each kind of land, members of the public can fish and hunt in the tribally-managed Mission Mountain Tribal Wilderness and the Ninepipe Wildlife Management Area, managed by the state. 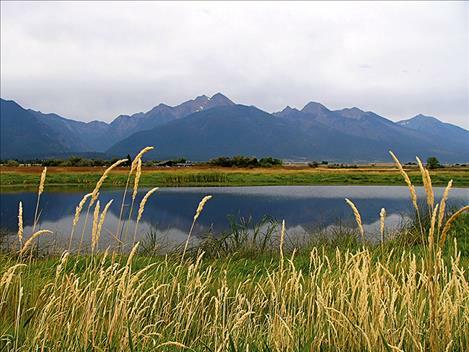 At the federally-managed Ninepipe National Wildlife Refuge and National Bison Range, hunting is not allowed but fishing is permitted. Other areas of public or tribal lands available to permitted hunters and anglers are located throughout the valley. Permit fees are often used to manage and improve hunting and fishing opportunities. CSKT has jurisdiction over all hunting, fishing and trapping on the reservation. While tribal land is not public land, non-tribal members can obtain a permit to recreate on tribally-owned land. Those who are not members of CSKT must purchase a permit with stamps for hunting and fishing if they wish to hunt or fish on the reservation. Non-tribal members are only eligible to harvest the following from the reservation: fish, gray partridge, pheasants, ducks, geese, mergansers, and coots. Tribal members can hunt for big game and birds excluded from this list. Stacy Courville, wildlife biologist for the CSKT Department of Natural Resources, said that the tribes allow non-tribal members to hunt and fish on the reservation to create opportunities for outdoor recreation for all members of the public. “They don’t have to leave the reservation if they want to go waterfowl hunting,” he said of non-tribal residents of the Mission Valley. Mike Koole, refuge officer at the National Bison Range, which is managed by U.S. Fish and Wildlife, as is Ninepipe National Wildlife Refuge, said that the regulations on hunting and fishing on public lands of all kinds are tailored to the overseeing party’s goals for that land. At the Bison Range for example, the goal is to provide habitat for bison. At Ninepipe, the mission is to provide habitat for birds. Hunting and fishing are allowed based on their compatibility with those goals. Though hunting and fishing is managed with a variety of objectives in mind, land management agencies coordinate their regulations for the convenience of the public. “Within the reservation, Fish and Wildlife, the tribe, and the state work together to try to make our regulations as similar as possible,” Koole said. Public lands management and access has recently been the subject of statewide attention. In December 2017 Montana Sen. Steve Daines proposed The Protect Public Use of Public Lands Act, which would remove Wilderness Study designation from five areas around the state. Wilderness Study Area designation is meant to prevent development on land until Congress decides that it should be classified as a wilderness and further protected, or managed by the Bureau of Land Management for other uses. Removing Wilderness Study designation would mean that roads could be built in the areas, and that restrictions on activity would be removed. While none of the WSAs in question are located in Lake County, Daines’ proposal has sparked conversation about the process that should be used to regulate public land across the state. Senators Steve Daines and Jon Tester both support a congressional bill that will permanently fund the Land and Water Conservation Fund. If reauthorized, part of the fund would be used to increase access to public lands for hunters and anglers in Montana. The fund will expire in late September if Congress does not pass legislation to fund it. Dave Bunnell said that the Mission Valley chapter of Pheasants Forever is in favor of funding the LWCF. He said that the fund could increase access to public land in Lake County by compensating private landowners who allow members of the public to hunt on their land. He added that the fund could have “a significant impact on future land purchase capabilities of the state,” which could increase accessibility of existing hunting and fishing opportunities in the Mission Valley.